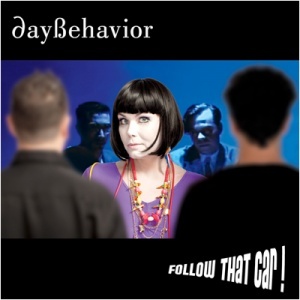 Before I decided to review the latest album Follow the Car by the group Daybehavior I searched for them on youtube and found a trailer for the album. Very dramatic the trailer is made like for a film and the music fits. The trailer convinced me to review Follow the Car. In the trailer as well in the press release Daybehavior bragged about how many awards they got, and so it is no wonder that I had high expectations. First a little information about the band. Daybehavior are a trio from Sweden, consisting of Paulinda Crescentini, Tommy Arell and Carl Hammer. The group is known for making soundtracks and soundtrack-like music combined with synth-pop and darkwave elements. Follow the Car is their third album, first time self-released. Secondly, the haptic and visual factors: The CD comes with a nice booklet. The cover shows the band members, in the centre singer Paulinda. I take it out and browse through it. I am surprised about the nice layout of the lyrics, which are printed for each song on one page. Each page is in a different style, but they all remind of 50's cinema. Finally, and, most crucially, the audio analysis. On Follow the Car you will find "12 thrilling new episodes of crime, passion, love and lust", as the trailer promised. That means the songs are telling a common story. As such, one can only understand the music on the album when listening to it as a whole. Although, there have been released already two singles 'It's a Game' and 'Silent Dawn', which "both got great reception in the webzines and blogosphere". Not bad songs, to which you can also listen to if you do not know the whole record. However, there are other gems to find on Follow the Car apart from the two singles. The song, which left the biggest impact on me was the trip-hoppish track 'The Blue Film'. Some songs may remind of Bat for Lashes. The album Follow the Car has its pros and contras. I, for my part, liked the use of different synthie effects. On the other hand, I could not really find a way to let myself "fall into" the whole story. If you can, this record is, for sure, able to take you away from reality. In the end, my expectations were higher than that what I have gotten in the end. But, you can simply see it as a soundtrack for your next road trip.